In a historic effort to measure the pulse of African American voters, the National Newspaper Publishers Asso­ciation (NNPA) partnered with Howard University to conduct the first scientific poll focused on the Black community taken during the 2016 election cycle. 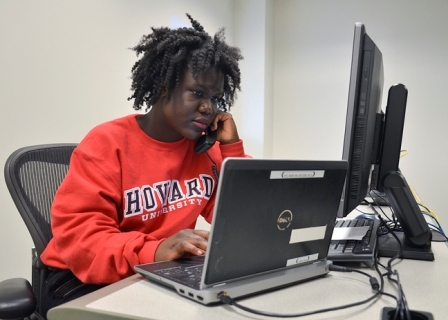 “The NNPA was pleased to join with one of the nation’s leading historically Black colleges and universities, Howard University in Washington, D.C., to conduct, analyze, and present timely and strategic findings that pertain to the political, economic, social interests of Black Americans across the United States,” said Benjamin Chavis, the president and CEO of the NNPA. The NNPA represents more than 200 Black-owned media companies that reach an estimated 20 million readers every week. “The Howard University/NNPA National Black Voter Poll is very important during this momentous season of political change,” said Chavis. The 2016 Howard University/NNPA National Black Voters Poll covered a range of issues including racial inequality, criminal justice system, jobs and the economy, global trade, terrorism, education, immigration and environmental pollution. The poll was conducted by landline telephone and more than 420 people, who self-identified as Black, completed the questionnaire. Rubin Patterson, the chairman of the Department of Sociology and Criminology, said that the 2016 National Black Voter Poll is of huge importance, not only because it is a collaborative product of two major Black institutions — Howard University and the National Newspaper Publishers Association — but also because it is the first scientific poll of the Black community concerning the 2016 election season. The 2016 National Black Voter Poll is of huge importance, not only because it is a collaborative product of two major Black institutions — Howard University and the National Newspaper Publishers Association — but also because it is the first scientific poll of the black community concerning the 2016 election season. Howard University faculty and students from multiple departments were represented including Economics, Political Science, Sociology, and Communications, Culture, and Media Studies. “This multi-disciplinary team has drawn on its expertise to develop a comprehensive polling instrument designed to assess the opinions of Black Americans on the presidential candidates and other important issues facing the Black community and the nation,” said Terri Adams, the associate dean of the College of Arts and Sciences at Howard University. William E. Spriggs, the chief economist at the AFL-CIO and an economics professor at Howard University, said that the national poll will let people see the motivation of registered Black voters to vote and the motivations behind their choice of candidates. “Instead of hidden behind a mask of race as motivation, this survey will show how income, education, success in the job market, all act to motivate the Black vote,” said Spriggs. Denise Rolark Barnes, the chairwoman of the NNPA, said that African Americans have a huge stake in this election and mainstream polls have often ignored their issues. “This joint effort between Howard University and the NNPA shows just how much we care what African Americans think about the issues that will influence their voting choices on November 8,” said Rolark Barnes. According to an ABC News/ Washington Post poll conducted in September, 93 percent of likely Black voters favored former Secretary Hillary Clinton in the presidential race; just three percent of likely Black voters favored the Republican presidential nominee, Donald Trump. Chavis said that the HU-NNPA National Black Voter Poll is very important during this momentous season of political change.